Jon Thomson and Alison Craighead (Thomson & Craighead) make artworks that examine the changing socio-political structures of the Information Age. In particular they have been looking at how the digital world is ever more closely connected to the physical world, becoming a geographical layer in what they describe as our collective sensorium. “Time is often treated with a sculptor’s mentality,” they say, “as a pliable quantity that can be moulded and remodelled,” that is. Jon Thomson is Professor of Fine Art at The Slade School of Fine Art, University College London, and Alison Craighead is Reader in Contemporary Art at University of Westminster and Lecturer in Fine Art at Goldsmiths University of London, but they divide their time geographically, living and working between London and Ross-shire. As artists Thomson & Craighead have been working since 1995 – some 24 years now – and as Jon Thomson notes, they are now focussing on organising their own archive, which will be no mean achievement, I’m sure. Meanwhile, LUX Scotland has invited them to make a selection of works from the Lux collection as part of a guest-curated programme too be screened at Eden Court, Inverness. 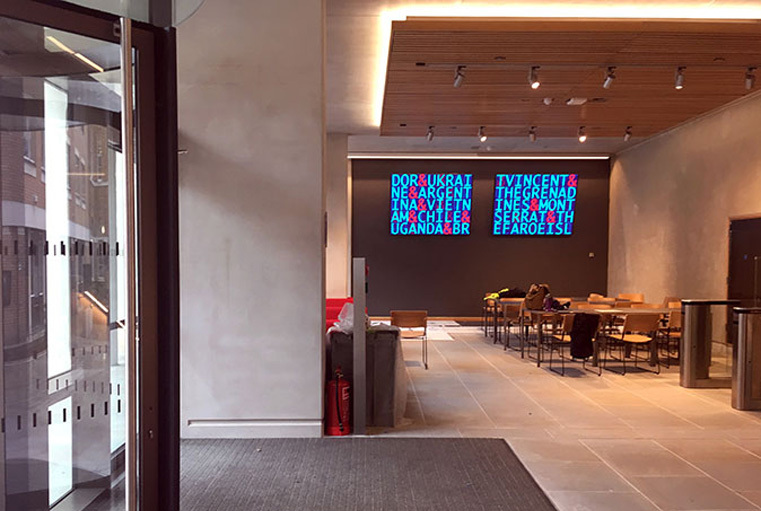 Elsewhere, the artists are focussing on their archival work, too, and as artists they just completed a public art work for a new student centre in Bloomsbury for University College London; Here Not Here. Thomson & Craighead, Here Not Here. Thomson & Craighead, A Temporary Index. From a personal perspective, hearing these names and remembering organisations now gone is a real joy. Personally, I have fond memories of many of the moments in art filmmaking history that Thomson & Craighead allude to, and I wonder if our paths have ever crossed. In the mid-1980s when all moving image work was what many refer to now as ‘dead format media’ (i.e. analogue / non-digital), and art films were largely classified as such according to often quite arbitrary judgement (a well-known critic once quipped to me that “you know it is an art film if there is a hair in the gate”), it was to either the London Film Co-Op or London Video Arts the I would go to when needing to view an NTSC tape sent to me from the USA for review, or to get access to a U-Matic video player for similar review material here in the UK, also. The wealth of talent that passed through the doors of those organisations is too numerous to mention here, and the history of both that eventually came together as LUX (long after I had moved on to other things) is, it seems, still very much in the making, and rightly so. With wider regard to LUX Scotland in particular, therefore, also worthy of mention here is that I recently received information concerning a call for proposals for Margaret Tait 100 – that is, an open call for film commissions celebrating the influence and legacy of Scotland’s pioneering filmmaker and poet, Margaret Tait. As part of the Margaret Tait 100 programme, ten new works will be commissioned, five of which will be drawn from the open call process. These will be presented alongside new commissions by curator and filmmaker Ute Aurand; director and writer Mark Cousins; artist, filmmaker and musician Luke Fowler; writer Ali Smith with artist and filmmaker Sarah Wood; and curator and filmmaker Peter Todd. LUX Scotland are now inviting proposals from Scotland-based artists and filmmakers for new short moving image works that respond to the life, work, approach or attitude of Tait. Envisioned as ‘one-minute for Margaret.’ Further information here. Thomson & Craighead will introduce the screening at Eden Court, the total duration of which is 48 minutes.